This morning I read a post by Brady Forest at O'Reilly Radar about David Troy's new FlickrVision. This is a really cool mashup that lets you see the location on Google Maps of new pictures posted to Flickr as they are uploaded (at least the location of the user at least). It is mesmerizing to watch. David Troy was the guy who made the very cool Google Maps mashup called TwitterVision - which lets you follow Tweets from Twitter in real-time. 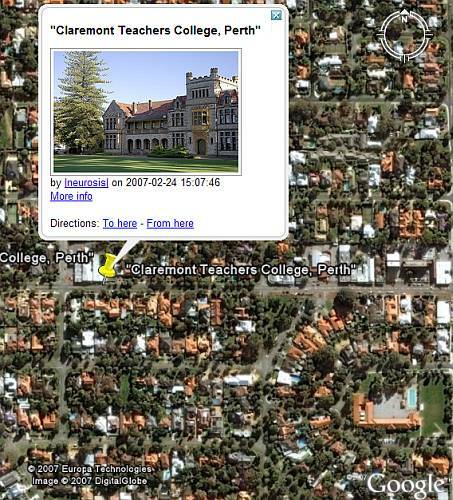 Here's the fun part - Just yesterday, Stefan Geens posted about a cool application he found which uses Yahoo Pipes to pull geotagged photos from a Flickr user and output the results as a KML. Using this, and a nifty touring feature in Google Earth, you can get an even cooler effect for watching Flickr photos in Google Earth. Thanks to the power of the GE network link, I figured out you could run the whole thing from within Google Earth. Download a file I call "Flickr Shower " which will show you the Flickr photos of someone I found who had geotagged photos (Flickr user 'neurosis'). It's just a simple network link which runs the Yahoo Pipe with a different Flickr id. Check your "Tools->Options->Touring" setting for "Show balloon when tour is paused" - make it turned on. Also, make the "Tour Pause" setting to about 4.0 seconds (or whatever you want). Click on "Tools->Play Tour" menu option, or simply click on the right arrow "Play" button just below the Places pane (make sure the "Flickr Shower" folder is selected). You should see a FlickrVision-like tour of these photos in Google Earth. Now, I'm sure someone can figure out a way to modify the Yahoo Pipe 'Steeev' did to automatically grab the most recent Flickr photos that are Geotagged. 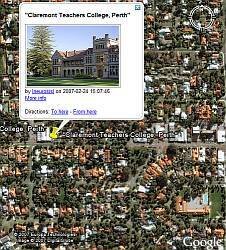 Then, we can easily watch the most recent photos using Google Earth just like FlickrVision! Anyone up to that challenge? In the meantime, you could just modify the "nsid" parameter in the URL link of the Flickr Shower network link for a user who has geotagged photos, and view them right away. See the notes I put in the network link description. I've been looking for something exactly like this! Now, if we could really get this thing hightech, we would have a super-combo kml feed which contains latest flickr photos by user/group as well as geo-referenced twitter entries (user specific) logged through the mologogo service to create a geo/photo/mobile timestamped blog in google earth...a true first! If someone can make this, I bet you I can get a Presidential candidate to employ it. Anyone willing to take me up on it? one more thing: the twitter portion of it should work like twitervision: wherever the last place mologogo identified you as being is where all subsequent twits you send would be identified as coming from. largely based on Steeev's pipe, so gets the same display of flickr photos, but found had to use a different Flickr method, which doesn't offer the same filtering options. But it looks like can use Steeev's one if you remove the user id but enter a tag for example.